I have recently rediscovered Steven Raichlen’s Barbecue Bible website and there’s a good selection of interesting recipes on there. We decided to do a barbie at short notice to take advantage of a rare sunny day in a dreadful English May. We decided on Green Chile (Chilli) Chicken Under Bricks. Chicken breasts are marinated in a mixture of salt, black peppercorns, cumin, garlic, green chilli (we only had red ones), chopped cilantro (coriander), lime juice and olive oil. We didn’t use the bricks as recommended in the recipe, but the chicken was deliciously succulent. We served the chicken with Delia’s Anya Potato Salad with Shallots and Vinaigrette and mixed leaves with a vinaigrette dressing. An excellent al fresco meal. 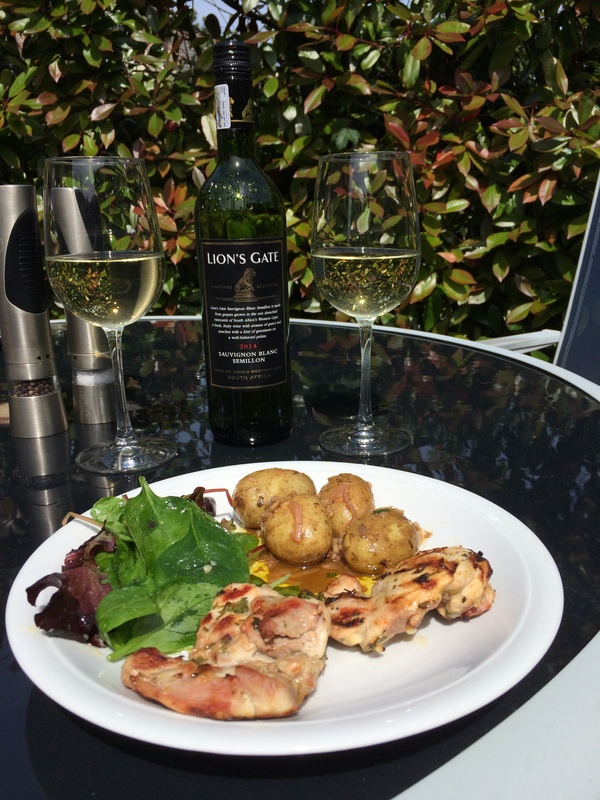 We paired the meal with a bottle of Lion’s Gate Sauvignon blanc Semillon 2014, a South African white from Tesco. The nose was grassy and the palate started slightly sweet, followed by tropical fruit flavours, with a drier finish. The wine was a good match with the barbecued chilli chicken. 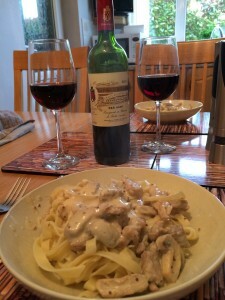 A few weeks ago we cooked a pleasant Pork Stroganoff recipe, which was one of three we discovered online. This one is by Jo Pratt and we found it here on the Lifestylefood website. It combines pork loin steaks with onion, chestnut mushrooms, cayenne pepper, paprika, brandy, Dijon mustard, creme fraiche, water, lemon juice and parsley. 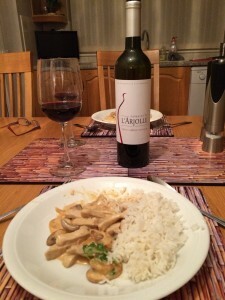 The recipe leaves the steaks whole and the sauce is poured over, but for a Stroganoff we prefer the meat cut into strips, cooked and then mixed with the sauce. We served with boiled rice and thought this recipe tastier than the last one. We noted that the Wine Society recommend their Domaine de l’Arjolle Merlot/ Cabernet Sauvignon 2012 with Delia’s Pork Chops with Wild Mushrooms and Creme Fraiche, a recipe we have tried previously and enjoyed. 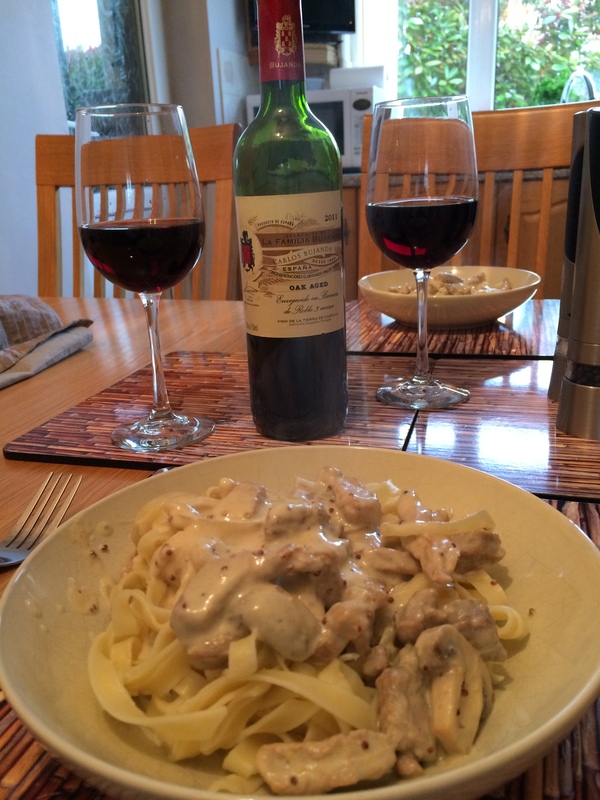 We thought the wine would go equally well with the Stroganoff, so opened a bottle. This medium-bodied Southern French red displayed nice legs in the glass and we tasted red and black fruits, particularly spicy cherries and also some vanilla sweetness. A lovely wine that was a very good match with the meal. 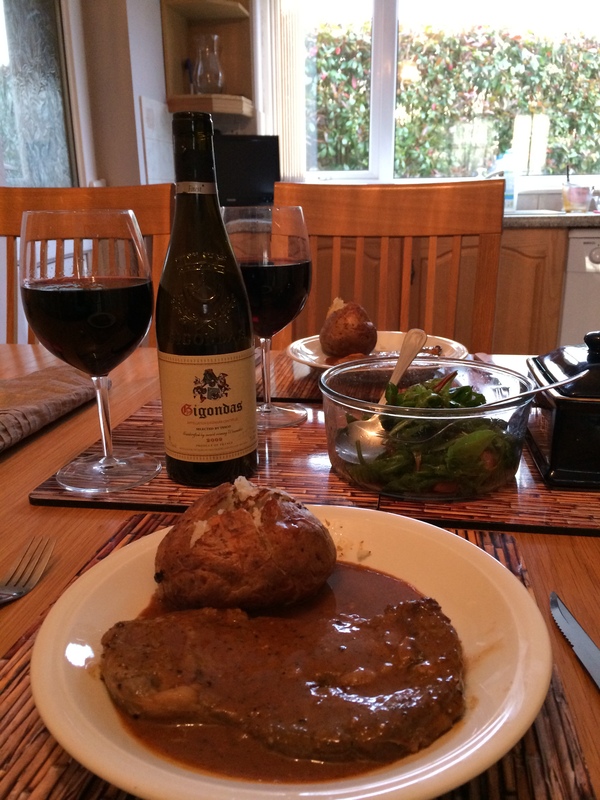 We were looking for a recipe to pair with a bottle of Gigondas we had and thought peppered steak would work well. We found Entrecôte Steak with Creme Fraiche and Cracked Pepper Sauce on Delia Online. We had some rib-eye steaks available so used them instead of Entrecôte or Sirloin. The steaks were pan-fried with a reduced fresh beef stock, Cognac, crushed black peppercorns and crème fraîche. As suggested by Delia, we served with a jacket potato and a leafy salad. 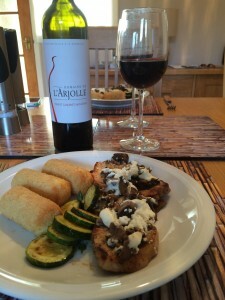 This superb recipe deserved a decent bottle of wine. We opened our bottle of Tesco’s Finest Gigondas 2009, a full-bodied French red from the Southern Rhône and a blend of Syrah and Grenache. We savoured its berry fruits, pepperiness and smooth vanilla spiciness with the steak and thought this lovely wine was an excellent match with the meal. We enjoyed the remainder of the Lasagne from last night and this time opened a bottle of Poggiotondo Chianti 2008, a medium-bodied Italian red from Waitrose. It is a blend of Sangiovese with a little Merlot and was mellow, juicy, with plenty of red fruits, particularly cherries. It was fine with the meal. We had another variation on Delia’s Beef Lasagne tonight and it seemed appropriate to open a bottle of Collezione di Paolo Erta e China 2006, an Italian red from the Sunday Times Wine Club. This a Super Tuscan blend of Sangiovese and Cabernet Sauvignon. It was quite full-bodied and we tasted red fruits, cherries with a touch of vanilla. A lovely mouthful and a very good match with the Lasagne. We are in “hash mode” at the moment. This time we had some leftover cooked ham to use up and decided upon Ham Hash Cakes with Parsley Sauce from Delia Online Delia suggests that instead of the parsley sauce the hash cakes can be served with mustards, pickle or chutney. We decided on a selection of mustards. The ham hash cakes contain cooked ham, potatoes, gherkins, parsley, egg and breadcrumbs. We opened a bottle of Georges Duboeuf Beaujolais Villages 2008 from Costco and found this smooth light red with strawberry and raspberry fruit to be very good with the Ham Hash. It particularly went well when the hash was accompanied by Dijon mustard. We ate the remainder of the Delia Moussaka from the previous evening. We decided to keep with a medium-bodied red, but switched to a bottle of Campo Viejo Rioja Crianza 2008 from Costco. This is a reliable, versatile food wine and we tasted red fruits with strawberries and cherries to the fore. We also enjoyed the spicy, vanilla, savoury finish that the Moussaka accentuated. However, we are coming to the conclusion that Moussakas are a challenge to pair well with wine. We had Delia’s Moussaka. Previously we have paired this with a medium-bodied Southern French red and a Rioja Reserva. 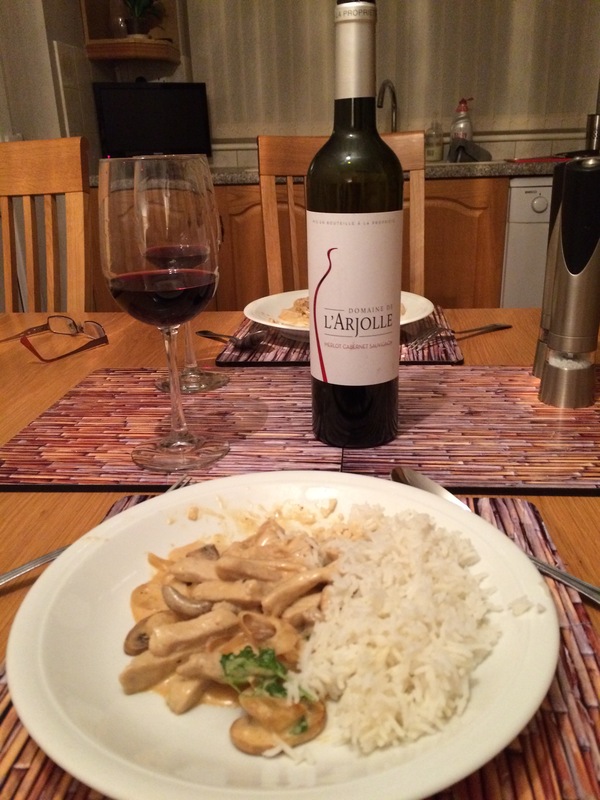 The French wine worked better, so we thought a similar medium-bodied red would be good. We opened a bottle of Monastery Merlot/Cabernet Sauvignon/Shiraz 2009 from the Sunday Times Wine Club – a medium-bodied red from Romania. It had worked well with Roast Beef previously (see 23rd November 2011). With the Moussaka we tasted red fruits but the wine just did not blend well and had an unpleasant sharpness. One positive was that the red onions and feta cheese in the accompanying Greek Salad brought out some savoury notes in the wine.